On Tuesday night Jim presented the output from last years book project in the form of two incredibly attractive and well finished hardback books. – As a club, produce a body of our favourite images of the last year, not necessarily those that did well but those that we loved the most. The results are a testament to all and especially to Jim and Vittorio who took the time to construct the final books. Within the club circuit, almost everything is geared towards the single image. Telling a story across multiple images is unusual, but outside the club environment it’s the basis of every photo essay published and many exhibitions and can provide an evocative and thought provoking insight into all situations. To stretch the abilities of the club and to try something new, it was decided to create a book based on a theme. A theme of “Things That…” was agreed, with each photographer finishing the sentence in their own words as they told their story of the “things that…” for them. Each story is an individual interpretation of the concept and the theme; resulting in a sequence of different narratives, each of which tells a tale. Working to a theme, be it a single image or a narrative like this, is a great exercise for a photographer. Where this differed from the single image themed competition rounds was in the need to build a thoughtful, logical sequence which built upon itself and where the whole exceeded the sum of its parts. In what became a challenging, thought provoking, and sometimes difficult exercise for the photographer, the results come together with a wonderful pictorial impact. The resulting book is a credit to all involved and a beautiful, tactile, legacy for both the club and the photographers. As club photographers, we’ve often been driven to try to shoot images that will succeed against a judges criteria or to only show work which can stand up to critique. The club year book goes beyond that, showing the participating photographers favourite work, the images they’ve taken in the last year that they love. The resulting images are an honest invitation from those concerned to show why they’ve taken up a camera, be it for photographs of loved ones, in an attempt to describe the world they see, or to share their humour with the world. 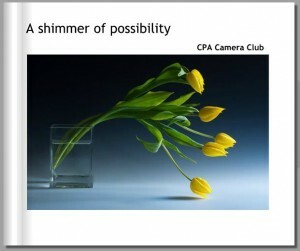 More than that, the book acts as a wonderful record of the some of the people and images involved in CPA during the 2011 – 2012 season. At the end of the night, Jim asked the club if they thought the exercise was worthwhile and if we’d be interested in doing it again. The answer to both was a resounding yes! Thanks to Jim for the effort he put in to herding the photographers concerned, and in organising the book. If you’re interested in a copy or would like more information, please contact Vittorio or Jim in the first instance as the club will try to order the books in bulk to reduce costs. Individual (print on demand) editions of both books will be made available later.